California was at the forefront of introducing a more guttural and blast-oriented death metal variant in North America, and Europe. Two bands were instrumental in the establishing of this new style. One of them was Deeds Of Flesh, the other Disgorge. 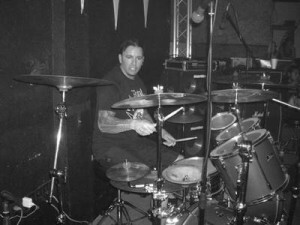 Disgorge is the lifeswork of drummer Ricky Myers, who has remained a fixture through out its many incarnations over the years. In its original run, which lasted from 1992 to 2006, the band released four albums. The first of these was “Cranial Impalement”, a demo compilation that served as a precursor to the band’s then-announced debut “She Lay Gutted”. The compilation features all demos that feature Matti Way in the vocal slot. “Cranial Impalement” is compilation of the second, and third Disgorge demos, which featured Matti Way in the vocal slot and Eric Flesley on bass guitar. Curiously the compilation omits the 1992 debut demo “Cognitive Lust Of Mutilation”, in all probability because it had Bryan Ugartechea on bass guitar and vocals. Notable is that Disgorge wouldn’t truly take off until the arrival of Diego Sanchez (rhythm guitar) and Benjamin Marlin (bass guitar) of formative genre act Strangulation. As Disgorge wasn’t an established entity at the time of this compilation’s release it is a question as to what prompted the release of this early archival document unto the general public. In broad terms Disgorge is stylistically similar to “The Mystical Gate Of Reincarnation” and “Sorcery” era Kataklysm, but with the technical finesse and percussive density of Cannibal Corpse circa “Bloodthirst”. Ricky Myers, much like Cannibal Corpse skinsman Paul Mazurkiewicz, has a drumming style almost entirely bereft of fills, and his playing is about functionality and simplicity rather than showmanship and needless complexity. The demo tapes feature two different sets of guitarists with the often forgotten original guitarist David Hill appearing on the “Demo 1995” and the pair of John Remmen and Tony Freithoffer debuting on the band’s second demo from 1996. Eric Flesley remained a constant presence on bass guitar through out the entirety of Disgorge’s demo phase. ‘Deranged Epidemic’ opens with an extended growl, and sets the tone for the vocal work. ‘Atonement’ would resurface on the fourth album “Parallels Of Infite Torture”. ‘Cognitive Lust Of Mutilation’ and ‘Period Of Agony’ is custodian to some interesting bass licks given the narrow perimeter wherein Disgorge dwells. ‘Maldororous Oblation’ attempts to infuse some traditional dark death metal riffing and melodies. The remainder of the songs are strong for what they intend to do with the band’s complete lack of motifs or adherence to logical song structure make them rather forgettable despite their strong technical backbone. Disgorge’s music might be completely over-the-top and out-of-control, but doesn't scale high on memorability. That ‘Outro’ consists of the same grunt as the one that opens ‘Deranged Epidemic’ is as much artistry as you are likely to get with a band like Disgorge. At least it creates a sense of cohesion, however filmsy it might be. The first four tracks compromise the 1996 “Cranial Impalement” demo tape, the band’s then-newest material. The last four tracks is the “Demo 1995” from 1995. The last track ‘Outro’ was specifically written and recorded for this demo compilation session. The only bone of contention is the lack of the first demo on this anthology. A vital piece in the band’s history is curiously absent from this archival compilation. Disgorge and Deeds Of Flesh share a similar set of influences (with the latter’s etching towards more technical outfits) yet both bands couldn’t be farther apart in terms of writing, sound and production. Disgorge always was the thicker, visceral of the two although its fourth album saw them flirting with more technical and diversified writing in terms of riffs and rhythm schemes. John Remmen broke ranks with the band in 1995 to form the shortlived Deprecated with future Disgorge frontman A.J. Magana. Deprecated would release its solitary “Deriding His Creation” EP in 1998 before going on an extended hiatus. A.J. Magana would go on to front Disgorge for one album in 2002, and Derek Boyer (bass guitar) would be enlisted by reformed NY death metal stalwarst Suffocation. Principal demo era members Ugartechea, Hill, and Freithoffer seem to have completely disappeared from the underground metal scene post their Disgorge involvement. Both demo tapes were recorded at JB Studios with Jim Barnes producing. The guitar is fuzzy and undefined on both, with Matti Way’s cavernous vocals taking up most space in the mix. The drums sound earthen but natural, and aren’t yet as processed as they would be on later releases. The bass guitar is more audible on these self-funded demos than on any of the label-sanctioned releases that were released in the following years. The artwork was created by Texan tattoo artist Jon Zig whereas Vic Mendoza of California pontifical death/thrash metal combo Ritual created the band’s now iconic logo. The compilation was released by Repulse Records and Extremities Productions in early 1999 as the band’s proper debut would was slated for release at the end of the same year. An argument could be made that this demo compilation arrived rather early in Disgorge’s then-nascent career. It does offer a fascination look into the band’s recent past and the subsequent albums that were to follow. It’s puzzling that Disgorge took the direction that they did with “She Lay Gutted” and “Consume the Forsaken” as the demos hinted at something more engaging altogether our website. It also begs the question why the initial demo with original vocalist/bass guitarist Bryan Ugartechea wasn’t included in this package as it would have given the listener a complete historical overview of the early days in the career of Disgorge, and how they progressed from one demo to the next. As a retrospective “Cranial Impalement” is interesting for that what it is, even if it is only partial complete. It remains doubtful whether the first Disgorge demo will ever resurface, there must be a reason why the band buried it as well as they did.